The audience at the recently held Davido 30 Billion UK Tour had a fresh experience of the magic, in a collaboration only the singer and his rival-turn-buddy, Wizkid, can create. The two are rated as the finest artistes on the continent with incredible size of followers and they proved it with a great show at the sold out concert which was held at the Brixton Academy, London. 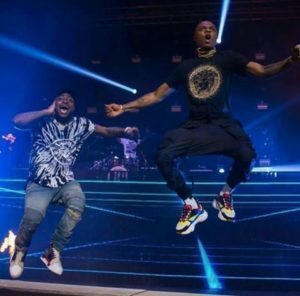 Davido shocked his fans at the show with the appearance of the Starboy on stage to deliver a joint performance of the song, Manya in a way that got the fans cheering loudly.